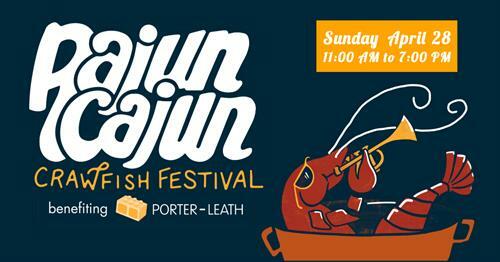 Porter-Leath is celebrating 27 years of its Rajun Cajun Crawfish Festival! The Annual Rajun Cajun Crawfish Festival takes place April 28, 2019 from 11:00 a.m. to 7:00 p.m. in Downtown Memphis on Wagner Place and Riverside Drive between Union Avenue and Beale Street. Rajun Cajun is one the few remaining Memphis festivals that does not charge an admission price in order to welcome all Mid-South families to enjoy a fun-filled day together. Enjoy live music from nationally known Louisiana Zydeco bands and local award-winning artists in Memphis, games including crawfish bobbing, eating, and racing, arts & crafts vendors, and a play zone for children ages 12 and under. VIP experiences are available and include the Monograms Foods VIP Swamp Tent featuring an all you can eat crawfish and cajun cuisine and Cash Saver Gumbo Cook-off with offers cash prizes. Tickets and team slots are available for an entry fee. Sponsorship opportunities are available now. Visit www.rajuncajunmemphis.org for more information. April 28, 2019 from 11:00 a.m. to 7:00 p.m.